Boost gaming experience : Game Booster will give you a boost of performance so you can play games smartly and this game booster free up memory space (RAM) to boost your phone, speed up Android game apps, and detect malware, so your favorite games should reflect on a smoother and better game play with less lag and more responsive controls. Launch your favorite games and powerfully boosts their speed performance with one tap advanced game booster application. Boosting speed performance in real-time and smartly frees up memory space up to 1.2 times while you play. Game Booster will unleash the real performance of your Android device. If you want to see what your device can really do with max potential, you should try it now! Game Booster app helps to accelerate your games. Memory freed immediately at game launching free up more space for your games so your playing will be smoother. Game Booster frees up your phone memory & close unused apps/tasks to boost best environment for your Android Game play. 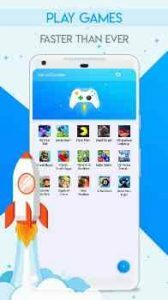 Game Booster frees up your phone memory & close unused apps/tasks to boost best environment for your Android Game play. This app also features “Game Mode” where you can choose to apply specified phone environment for your game. App works effectively with all devices and tablets. Even run on low RAM devices. Assign your favorite play style for each game and boost the app within that game play mode! Like Play offline Mode,Long Play Mode. Use GameBooster modes to boost your device to max performance. Play games with no lag. Kills unnecessary tasks and apps and frees up memory, boosts your phone for your best game play experience ever! Create your own Boost Mode and assign that mode to your favorite game! Please rate us.Your sustained support is the biggest motivation to our app improvement in future. Does seem to be working ! But the “preset” Modes seem to change after I set them the way I want them to be. For example i toggle ‘sync’ to Off & Save, next time I look sync is toggled back on. Otherwise it’s awesome. Thanks for making a easy to use & effective Game Booster! Great app, helps a lot with games that lag a little and kills all the lag spikes that cause crashes, thank you! I think that this app is amazing and i recomend this app for people who has slow phones like mine my phone is the samsung galaxy duos 2 and i am playing fifa mobile on it and whit this app it is like i am playing on a samsung s9note downloed this app it is the beast!!!!!!!!! Galaxy Watch Plugin – Galaxy Wearable App has to be installed in advance.